TinoVino is a Spanish and Mediterranean restaurant in Mexico City. The Design concept was developed using a mosaic element to create the logo and this same shape was adapted into various applications both in corporate identity and surface graphics. Corporate design applications include logo and logo variations, business cards and stationary, loyalty discount card, box for delivering bill/check, advertising pamphlets, invitations for inauguration and invitation for jazz night events and signage. 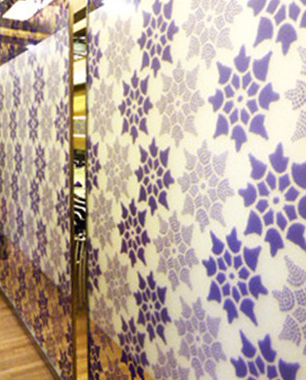 Surface design applications include creation of pattern based off of logo design in various forms: Decorative vinyl on glass that works as space dividers and decorative elements, laser cut wood panels on ceiling and mosaics that cover table tops.